I couldn’t say enough about how much fun and good food we enjoyed in Destin. We had some wonderful meals and made great memories. I can’t wait to go back, but for now, I’ll just settle for trying to recreate what we ate. I’ll share my hits and misses here. There was no way we could leave our fabulous time in Destin with a terrible last meal. Luckily, close to our vacation home was Camille’s. Camille’s is a tiny place above a scooter/bicycle rental store. I walked to it, and I found it to be quaint and comfy. I waited in the bar for my order to go, and the staff was very nice. The food? 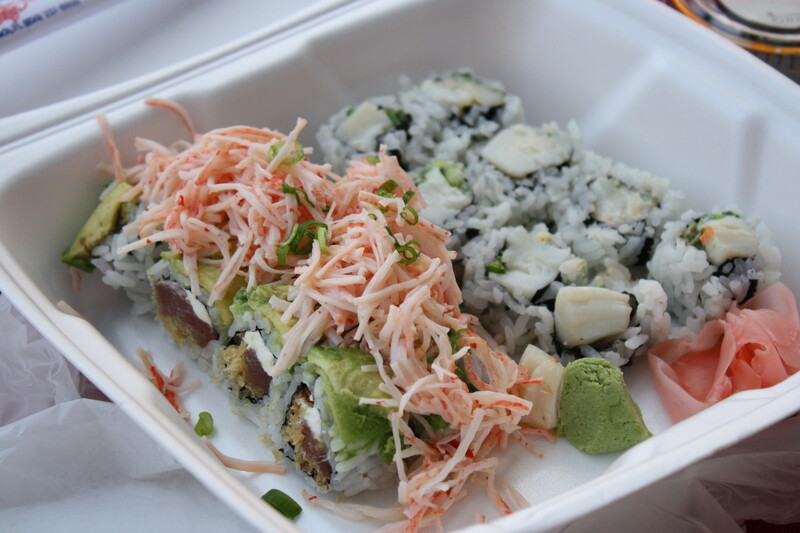 We had the Amazon Roll and Scallop Roll. It couldn’t have been better. Fantastic food enjoyed as a family on the balcony at sunset watching the waves. Now this is the way to end a great trip. Well, the final meal of our journey was upon us. 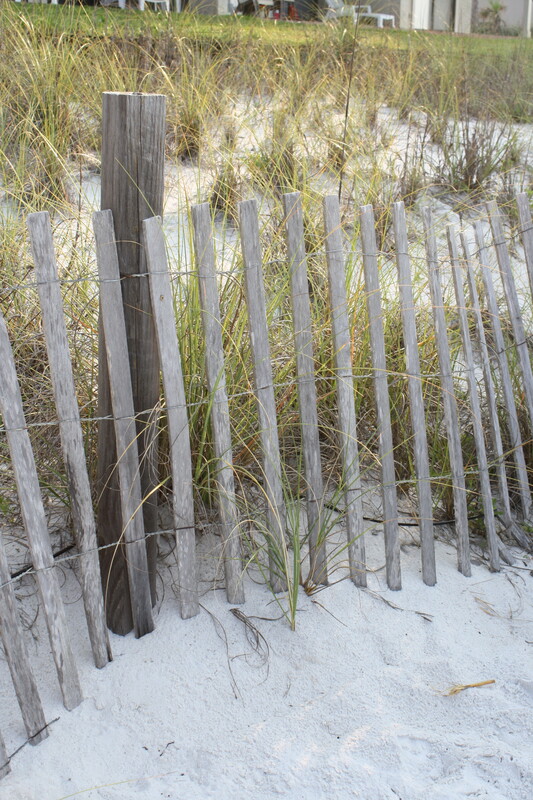 With only minor glitches, we had a successful trip to Destin both fun- and culinarily-wise. We made it to some places we really wanted to visit. We found some we weren't sure about but that turned out great. We skipped a few once we saw them. We had a big time. For our last dinner in Destin, we were unsure of what to do. Repeat a restaurant we loved to be sure our last meal was a great one or try something new with our one last chance? We still had plenty of places to go-Staff's, Bayou Bill's, and AJ's just to name a few. 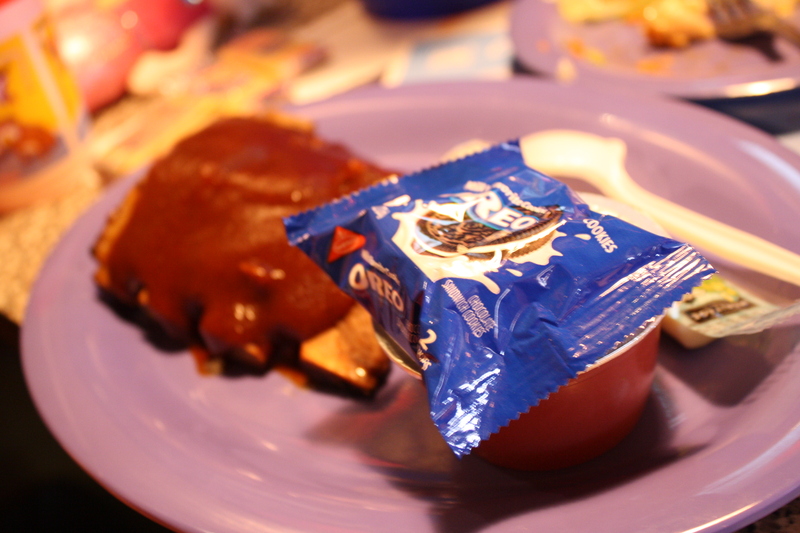 We wanted to end with another wonderful meal. The pressure! We didn't want to choose a bad place thus scarring our food memories. We deliberated, and then we decided to try The Crab Trap for our precious last Destin seafood meal. 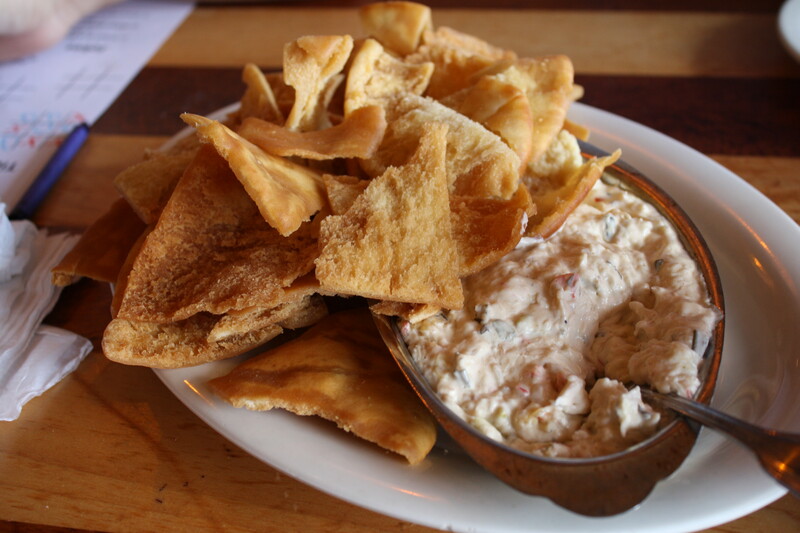 We started with what was called by our waitress “the most popular appetizer.” It was the hot crab dip. Let me save you a trip to Destin here. Just go to your local grocery store. In the deli, there will be a plastic tub of crab dip. Buy it along with a bag of pita chips. There you go. 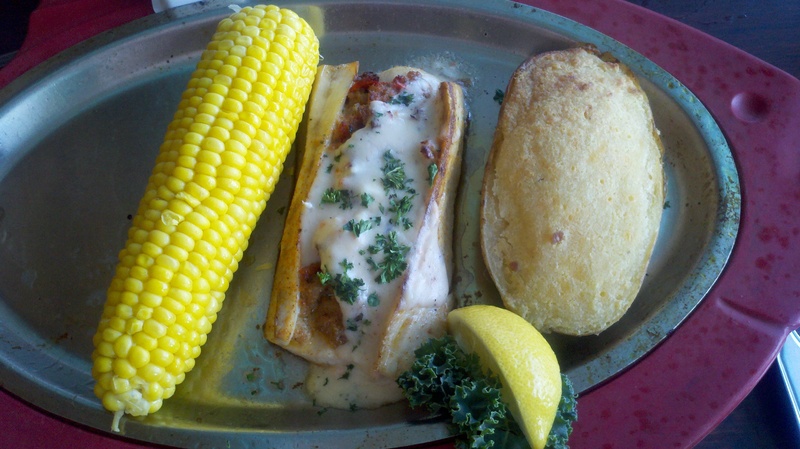 Whatever you can buy wherever you are is just as good as what The Crab Trap serves. It wasn’t even warm. The crab in said crab dip? I think they meant crab in a figurative way, cause there wasn’t much literal crab there. My husband wanted one last grouper sandwich. It is his favorite sandwich in all of the Gulf Coast. He has fond memories of some grouper sandwiches that were great. This was not one of them. I ordered the soft shell crab platter. I hadn’t had soft shell crab all week. This was my last chance to have some. I love soft shell crab. Once, I had a delightful soft shell crab at a restaurant in Memphis. It was my first encounter with soft shell crab outside of watching the Food Network. 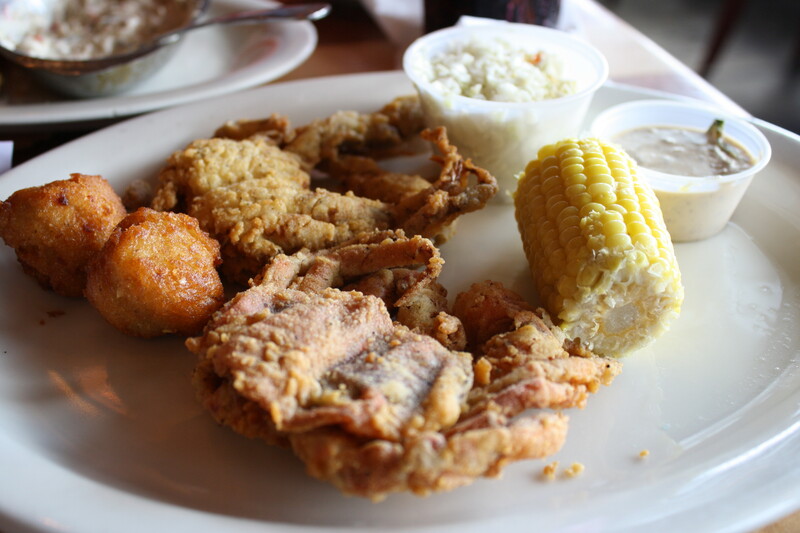 I have had many soft shell crabs since. Ah, the memories. Another time, at a local Chinese restaurant where we were eating off the buffet, I found some sort of crab concoction unfamiliar to me. At this restaurant and for the first time ever, I took a bite of the crab whatever-it-was, and I ended up spitting it out in my napkin. Understandable-I should have never tried unfamiliar seafood in Tennessee. The soft shell crabs at The Crab Trap? The second time I spit something into my napkin. Not understandable at a restaurant on the beach. First, I ate the legs off one of the crabs. So far, so good. Then, I bit in to the body of the crab. Out went that bite as fast as possible. It was gross. It tasted like sick fish. I mean gross. The corn on my plate? I got it instead of fries. Not an even swap. It was mushy and flavorless. I left The Crab Trap in the worst possible way-tired, $75 poorer, and hungry. It was not the way to end a great trip. The Old Bay Steamer is not a place to go for a great ocean view. You have to park in the back of stinkin’ nowhere and walk a while. The water is no where in view the whole time. As a matter of fact, the sign at the hostess’s stands says, “We don’t need no stinkin’ view.” So why go there when you are in the area to see the water? One reason. The place is dark, dark, dark, and the windows are closed. No sea breeze here. No one in there was wearing a bathing suit. If I had to guess, I would say most were locals. The walls are covered with fine (and not so fine) art without a mermaid or seashell in sight. The music? The Blues, baby. If you didn’t know better, you could easily be in Memphis. But I don’t think you’ll find food like this in Memphis. We started with the grilled scallops which were served with a spicy sauce and a mango chutney. De-vine. The chutney alone was delish, and the scallops were top notch. 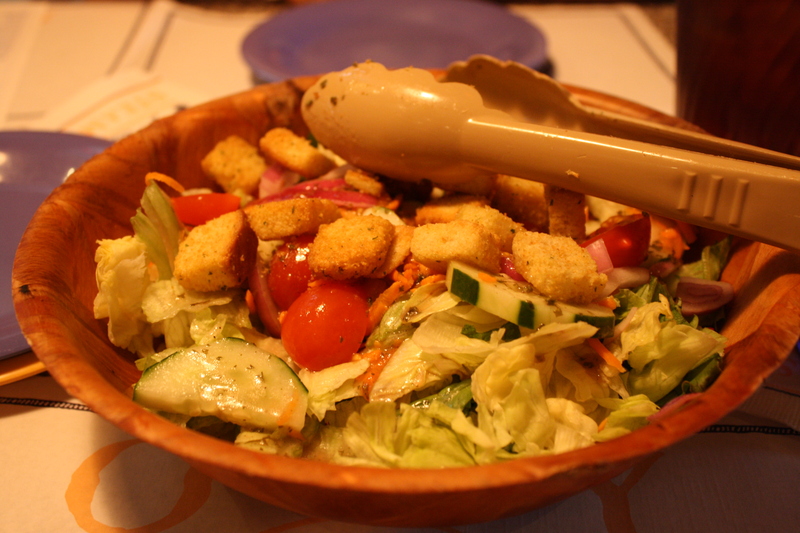 Next was the house salad served in a big bowl with only one choice of salad dressing, a wonderful house vinaigrette that settled finely at the bottom of the bowl. I had three helpings. Don’t judge me, please. One of my kids had a hot dog. 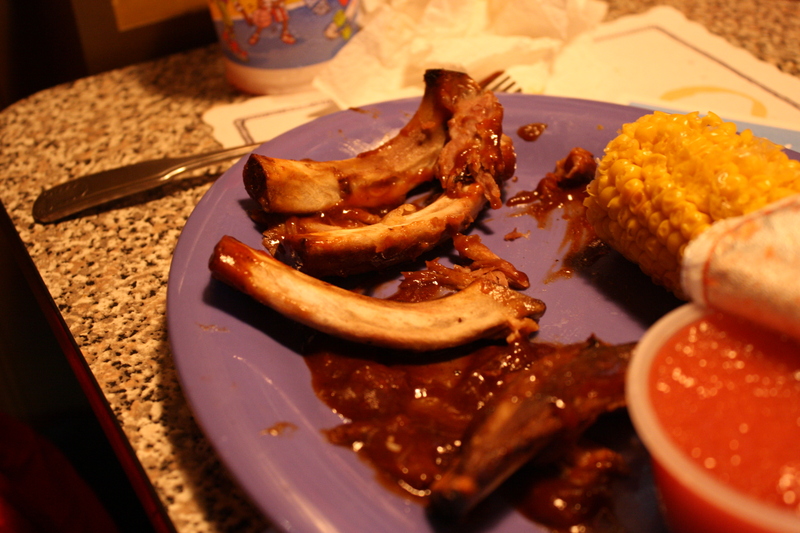 The other had the ribs. This ought to be good, I thought. My husband and I ordered the Big Steamer. 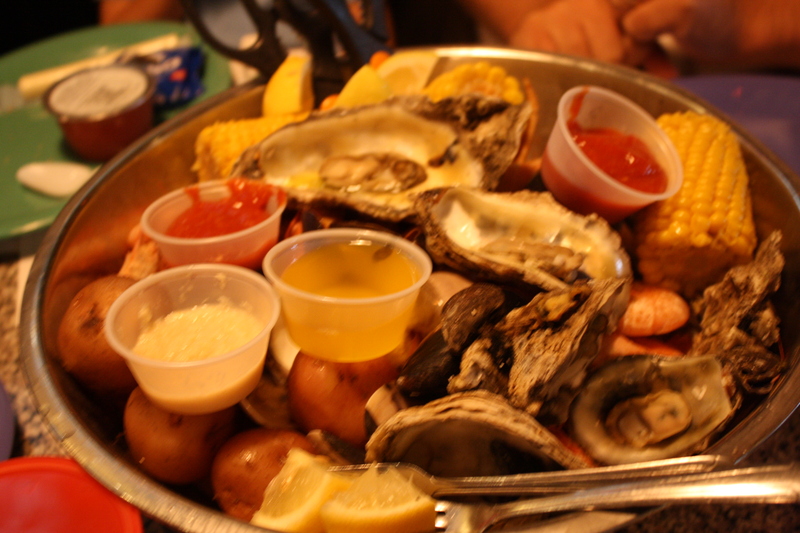 It turned out to be a big metal bowl of heads-on royal reds, oysters, clams, corn, potatoes, and crab legs. 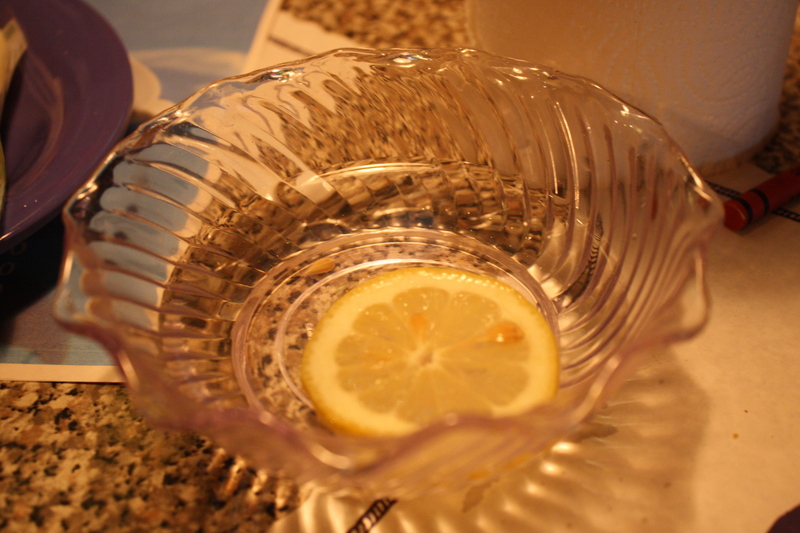 Everything in the whole bowl was so fresh that it snapped when we tore into it. Snapped, I tell you. I had never seen shrimp or crab legs snap. Usually, they are just mush and squishy shells. We ate every bit. It was some of the best seafood we’d had all week. She too ate it all. In my opinion, restaurants like Applebee’s, Red Lobster, McDonald’s, and such are fine. I eat at places like these all the time. They will do. However, I do believe that they have no place at all anywhere around vacation spots. Congress should regulate it. No Pizza Hut within one mile of any condo in the US. The idea of eating at O’Charley’s on vacation? Good grief. People have to be protected from themselves, I believe. Friends don’t let friends eat at Olive Garden while on vacation. It’s like kissing your sister on the mouth. You just don’t do it. Instead, you go off the beaten path. You go out of your comfort zone. You make memories in special places. You spend a little more to eat than usual. You save for a year to get out of dodge. Make it worth it. Go to a place like the Acme Oyster House. It is legendary. 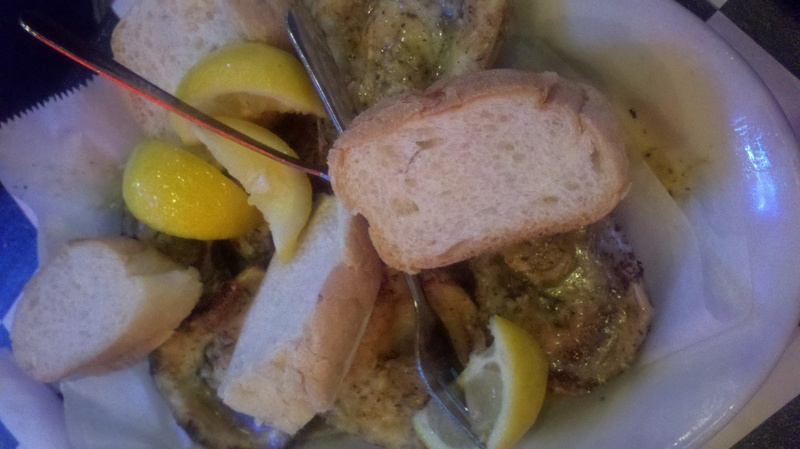 Famous for its fresh oysters and best known as a spot in New Orleans, it is where you go on vacation. We did. We found an Acme Oyster House in Sandestin, Florida. It was loud. It was crowded. It was busy. It was awesome. We started with the charbroiled oysters since my husband didn’t feel brave enough for the raw type. This is how oysters are done, my friends. I mean, it was the definition of fresh. I could see the guy shucking the oysters from where I was sitting. They were perfection, and you could see the oysters (unlike another Destin restaurant reviewed here). The only problem was that we only ordered a half dozen. I could have eaten another dozen by myself. 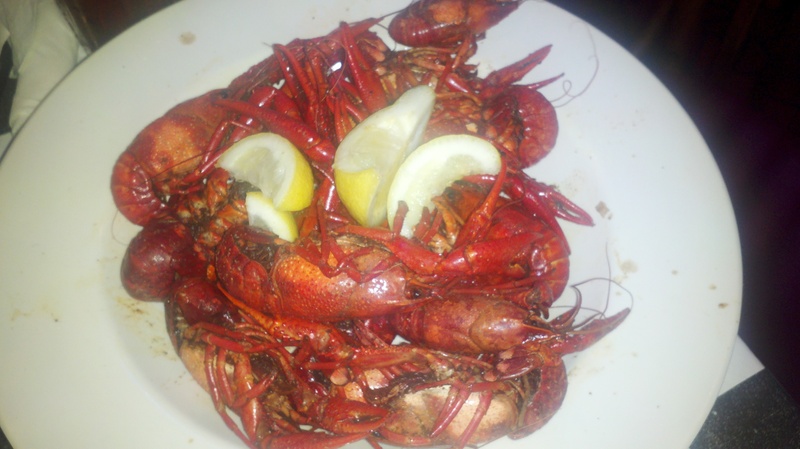 My husband’s main course was a pound of steamed crawfish. It couldn’t have been better, but again, he could have eaten another pound or two. 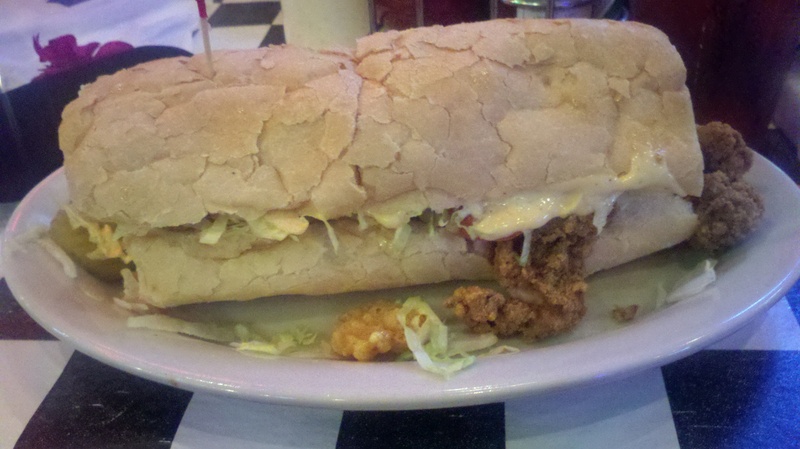 I had the Peacemaker, a sandwich with fried shrimp, oysters, and a tabasco mayo. I ate every drop. My mouth was on fire, but I ate it all. My only regret? We didn’t order enough of the oysters and the crawfish. However, I can live with that since we all left full and happy. We got to eat at a place that otherwise is way off our radar. I hope it’s not, but it could have been a once in a lifetime chance. It was a wonderful eating experience. And that is what vacation is supposed to be. Just as there are two sides to every sunny side up egg, there are two opinions here about Another Broken Egg Cafe. You have my husband’s, who is totally entitled to his own opinion even if he is wrong. Then, you have mine. I’ll start with his. In a minute. Another Broken Egg Cafe is a chain of restaurants specializing in breakfast food in several states primarily in the South. Until I started preparing for this trip, I had never even heard of it. I found it through Fodor’s, whom I follow blindly much like the GPS on my car- Stear me to great food, Fodor’s! They said to try it, and so we did. We entered Another Broken Egg Cafe relatively early-but not too early; we are on vacation-and we had to wait. To me, for a breakfast joint, that is a good sign. I can understand waiting at dinner, but breakfast is not a waitable meal to most folks. So the fact that there was a line meant good things to come in my book. When we went in, the cafe was quaint. The references to the chicken and the egg were there but subtle. It wasn’t a cheesy chicken place. I was expecting a hole in the wall, but this restaurant was very nice-almost fancy for that early in the morning. Awesome. She was in chocolate milk heaven surrounded by non-cheesy looking chickens. Of course, she wanted whipped cream. She got it in a fancy pink glass with chocolate chips on top. Score one for this place. Now, my husband’s side of the egg. When the waitress came to take our order, my husband ordered French toast. Fine. We were in a very nice restaurant so close to the Gulf that you can see it, and he ordered French toast. I wanted to yell, “We aren’t in France, man. 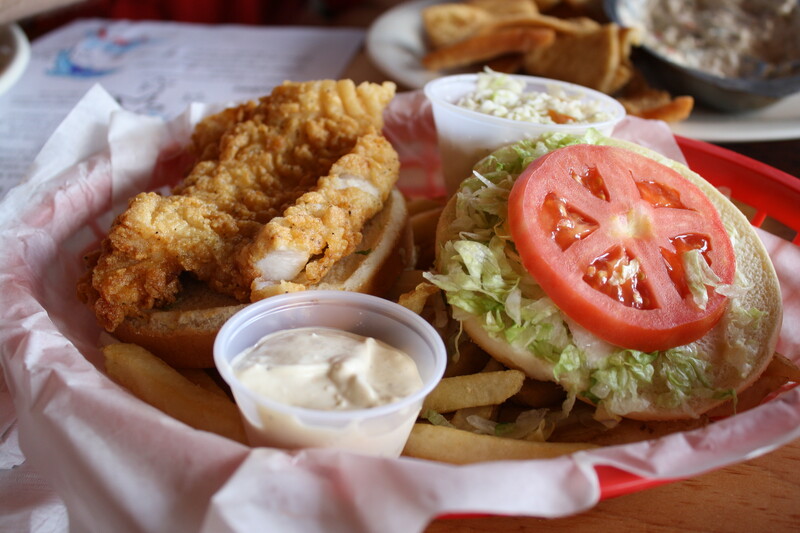 Order something off the menu with seafood in it, for Pete’s sake. Listen to Fodor’s!” Ugh. His response later was that seafood should not be for breakfast. He went on to say that eggs and seafood do not mix. His non-seafood French toast was not a success. The bread was wheat bread that was not coated enough with egg. He also thought it should have been fried a little more. It was pretty, but I agree with him. 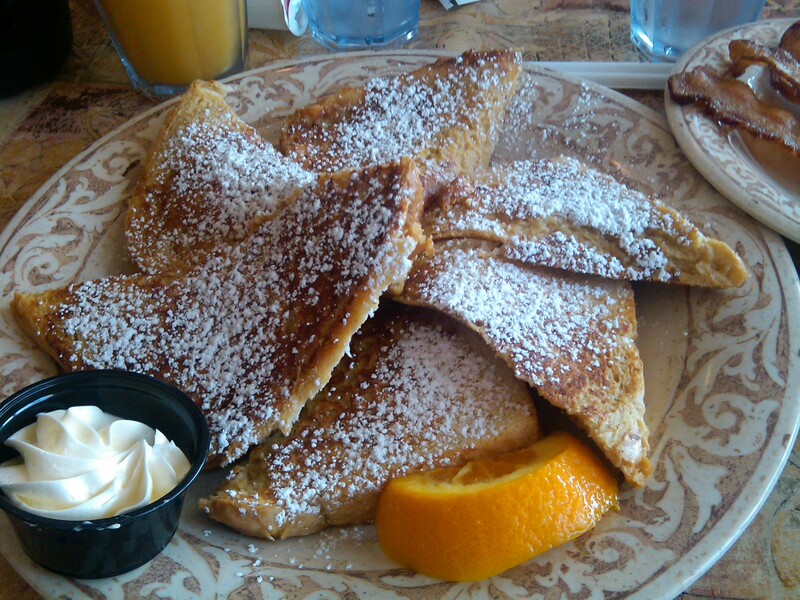 French toast should be thick and sweet. Minus one for this place. My side of the egg-I held in my urge to order from the scruptious sounding and expensive selection of Bendicts. 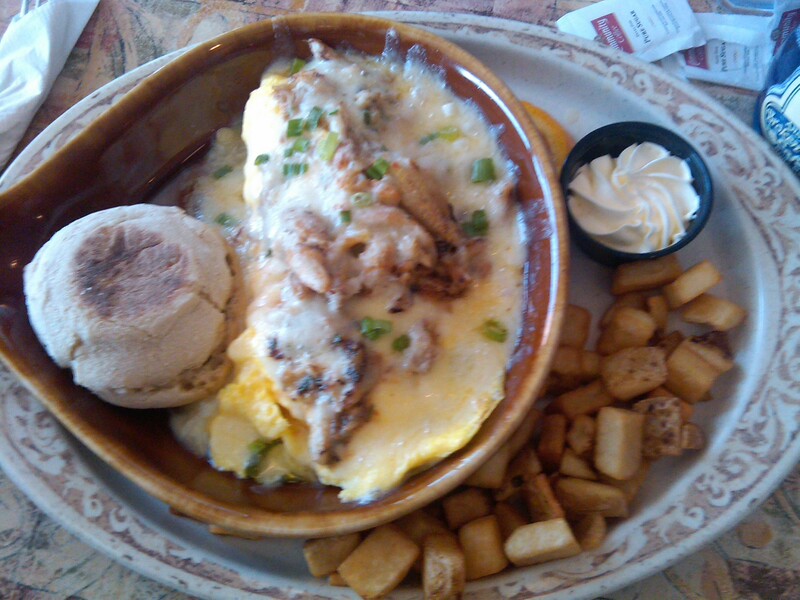 Instead, I ordered the Floridian, an omelete featuring crabmeat, a butter sauce, and cheese. My breakfast was a success to say the least. The omelet was light and the cheese was not overpowering. 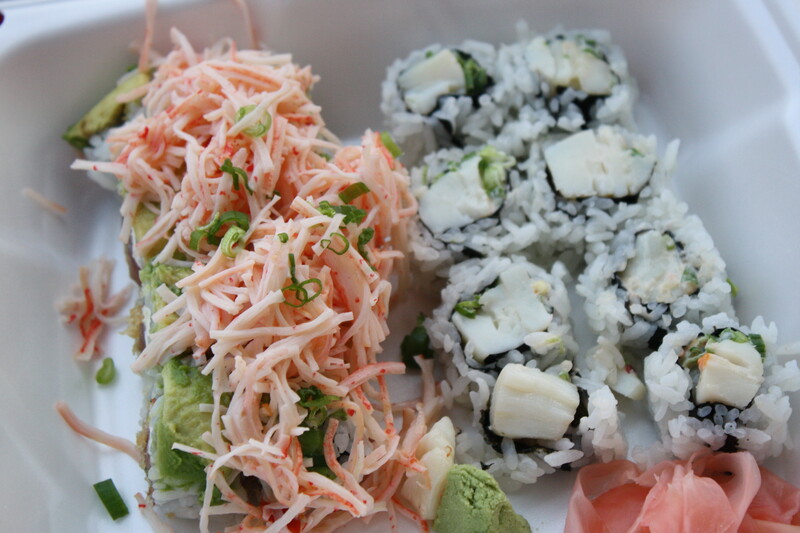 The crabmeat-I had plenty. I had a bite of crab and cheese for every bite of omelet. Delish. Score two. I looked so forward to eating at Another Broken Egg Cafe after seeing it in Fodor’s. Most of my family loved it. I hope that someday someone will franchise this cafe all the way to my neck of the country so I can have seafood for breakfast more often. Maybe even my husband will try it if they do. I looked forward to eating at The Back Porch. It sounded to me like a place my parents would like, and I mean that it a good way. I pictured old seafood restaurant style with boat furniture, old menus stained with butter, and nets everywhere. I anticipated an old-fashioned seafood place. It wasn’t exactly old-school seafood like that, but that was fine with me. It was a bright place outside featuring a large Adirondack chair for the kids to sit in for a quick picture. It also had cats in the yard and a slightly weird smell not related to the cats. After the chair pics and cat hunting, we were in. We had no wait even though we were told to expect up to a ninety minute wait. Once inside, The Smell continued, and it was a little dark in the middle of the afternoon. We ate at an open window overlooking a beach full of people sunning and playing in the sand. Several people walked right up and walked right in dressed in bikinis. I am nowhere near that brave. I eat too much butter for that. 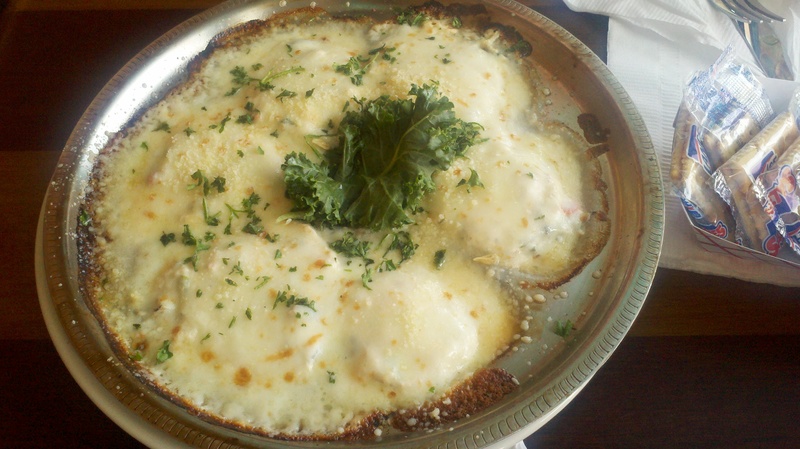 We started off with the Back Porch Oysters, an appetizer of oysters covered with a creamy sauce and cheese. The cheese and sauce together were delicious, but the oysters were hidden in the mix. They were so small and smothered by the sauce and cheese that they could have been left out and the dish would not have been affected that much. Not that I am complaining, I liked the dish a lot. I think the oysters on the half shell would have been a better choice. My husband ordered the crab legs. I don’t get why crab legs are so popular in the South when they are from Alaska. They were good, but run of the mill. 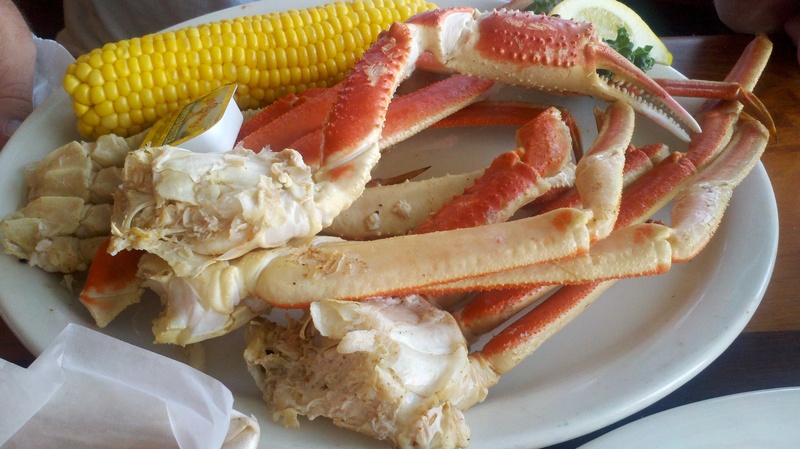 You can get crab legs of equal quality on any seafood bar anywhere. He liked them. 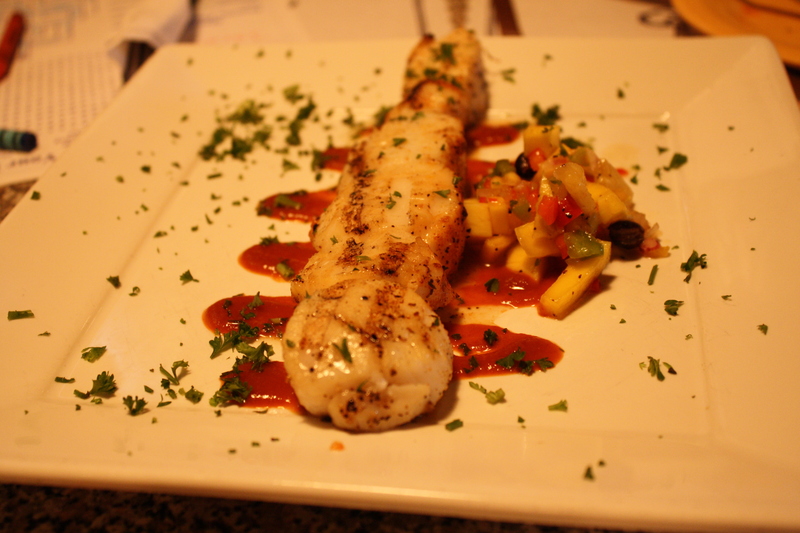 I ordered the lobster stuffed mahi-mahi. Why did I order lobster in the South when they are from Maine? Because I could. It was devine. The fish was fresh, and the lobster was plentiful. The sauce-my word, my mouth is watering just thinking about it. It was creamy and buttery and smooth. The corn on both of our dishes was unreal. The weird thing on my plate is a twice-baked potato. I took a few bites and then ignored it. At first, I thought it was a weird loaf of bread. Luckily, I wasn’t there to eat potatoes. 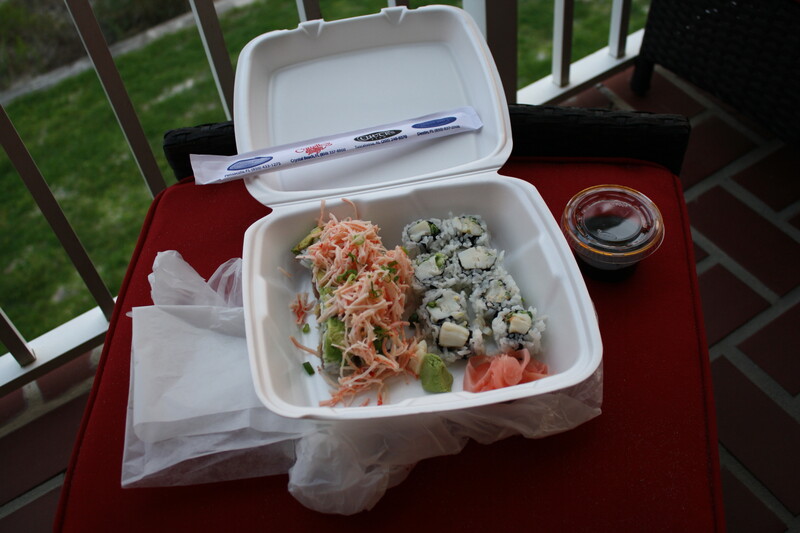 The Back Porch was good. I would only change a few things for my next visit. I may even bring my parents along.